More And More 4X4s Have AdBlue Fitted, So It’s Time To Learn More About It. Before we get into Adblue, a bit of background. Diesel is dying. Yes, the fuel us offroaders swear by, the one we have paid thousands of dollars for over petrol, is on the way out. The basic problem is that there are ever-tightening emissions laws, and diesels have a very hard time meeting these increasingly stringent requirements. There are many standards across the world for vehicle emissions, but the best-known one is the Euro standards, also (kind of) applied in Australia. So some of the largest cities in the world will ban diesels by 2025, and this isn’t an isolated case either. Diesels are targeted because they produce something nasty called particulate matter (PM), which are tiny particles of soot that hang in the air after combustion. Particulate matter is carcinogenic, which means it causes cancer – the International Agency for Research on Cancer lists particulate matter as a Group 1 carcinogen. These days, you won’t find any car manufactures standing up and saying they’ll develop diesels for the long term. Some may say that’s due to the #dieselgate Volkswagen Group saga, but the reality is diesel is a dead-end technology and the VW problems have just sped up the demise of the diesel. The way forwards is petrol-electric hybrids which look set to offer the torque and low-down driveability we love in diesels, as well as the efficiency. Just look at the world’s three hypercars; McLaren P1, Porsche 918 and Ferrari LaFerrari as examples. The Jaguar F-PACE is a luxury diesel SUV that runs AdBlue…but for how much longer? But for the moment, diesel still exists and is hugely popular for 4X4s, so much so that few manufacturers selling in Australia bother with petrol versions of low-range vehicles; Everest, Fortuner, Pajero, Pajero Sport are diesel-only, and Toyota sells far more diesel 4X4s than petrols, as does Land Rover. Most utes are diesel, particularly the 4X4 versions and higher-spec models. However, look at the USA or the Middle East where diesel has never been particularly popular, and never will be now. Diesel is popular with Aussie 4X4 owners because of efficiency – a litre of diesel has more energy than a litre of petrol, so you travel further for a given amount of fuel. Diesels are high-compression, so engine braking is good, important for steep descents. Diesel is not flammable, so it’s safer to transport than petrol. And diesels produce lots of low-rev torque, great for offroading and towing. So there’s many reasons to love a diesel 4X4, but one reason no longer exists and that’s simplicity. Back in the day diesels were indeed simple, you could even disconnect the battery and they’d run. Then came turbochargers and intercoolers, and now engineers have to resort to increasingly desperate measures to meet emissions targets. Even though all diesels are now highly computer-controlled with precise metering of fuel via high-pressure common-rail injection, such advances are not enough. That’s why there’s the diesel particulate filter (DPF), exhaust gas recirculation (EGR) and now, AdBlue. All of these three systems exist only for emissions reduction purposes, and all add complexity to the diesel, starting to destroy its reputation for simplicity and therefore reliability. The fact is, today’s petrol engines are lighter and simpler than today’s diesels, and starting to approach diesel driveability and efficiency. That’s the background to AdBlue, and now onto what it is. First off, some terms. The generic name for the technology is Selective Catalytic Reduction (SCR). The term “AdBlue” is a trademarked name that belongs to German Association of the Automotive Industry (Verband der Autombilindustrie, VDA), but that seems to have become the standard term, a bit like everyone calling a pull-through handwinch a Tirfor. In fact Tirfor is a French company who have had their winch design copied. Just to be different, Mercedes-Benz have used the term “BlueTec” for their system. We’ll use SCR for the rest of this article, and the fluid used in an SCR system is DEF, or Diesel Exhaust Fluid. The term AdBlue tends to be used for both the system and the fluid, and the VDA have licensed the technology and term to 158 organisations worldwide which is why you see it so often. ASV RAM Laramie with SCR. The DEF is composed of 32.5% urea and 67.5% high-quality de-mineralised (de-ionised) water. The active part of DEF is the urea, and if that sounds to you like urine, then you’d be right. Mammals eat and drink, and their bodies use much of what they consume, but there is a lot of waste product. One waste product is nitrogen, which mammals process via the liver and kidney, combining ammonia with carbon dioxide (CO2) to make a fluid called urea which forms part of your urine…so when you urinate you’re mostly ridding yourself of excess nitrogen. Urea is produced naturally by mammals – you probably are pretty good yourself – but it was also one of the first natural fluids to be recreated in a laboratory. The other part of DEF is the de-ionised water, which means that mineral ions such as iron, chloride and sodium are removed. The reason this is done is because the chemical reaction (catalyst) is very precise and sensitive to the chemical balance of the fluid or any impurities. A modern diesel exhaust will typically first flow into an oxidizing catalytic convertor which converts the pollutants hydrocarbon (HC) and carbon monoxide (CO) into carbon dioxide (CO2) and water (H2O). Then the exhaust goes through a diesel particulate filter (DPF) which removes particulates. And then there’s the Selective Catalytic Reduction, or SCR. The DEF is sprayed into the exhaust, and the water component evaporates, helping spread the urea evenly. The urea decomposes into ammonia and carbon dioxide, and NOx (nitrogen oxide) is converted by the ammonia into water and nitrogen. Around 90% of the NOx can be eliminated in this way. 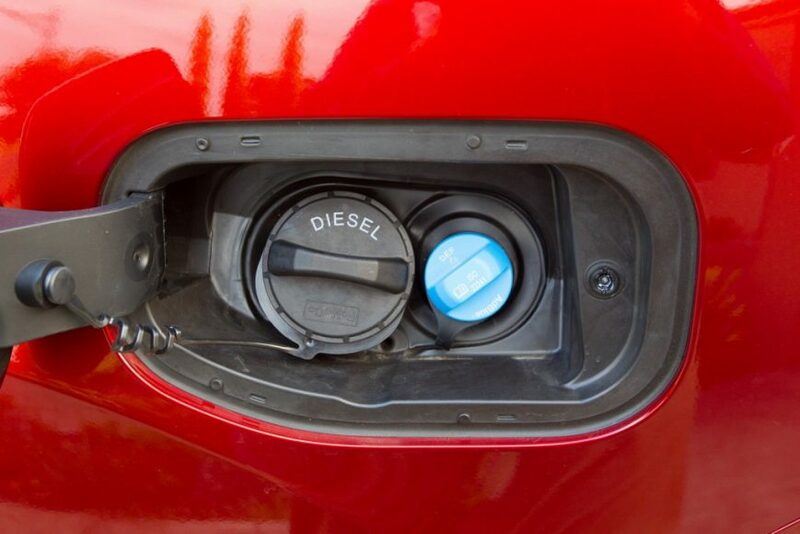 The DEF usage is usually about 1-4% of diesel, so for every 100L diesel used expect to use around 1-4 litres of DEF. SCR is now used everywhere diesel engines are used. It is commonplace on plant machinery and heavy trucks. It is becoming increasingly common on passenger vehicles and light commercial vehicles too, not least because you need an SCR system to meet the Euro 6 emissions standards. In practice, all you need to do is drive your 4X4 as you would normally. When the DEF is low the vehicle will tell you, and it will tell you well before it runs out – in the case of the Everest for example you get your warning with around 2400km to go., and you can check status at any time although all you’ll get is an “OK”. Generally, there is no usage monitoring on vehicles, just the notification to refill. The SCR system requires no user operation other than periodic refills. RAM Laramie with a DEF gauge on the left, one of the few vehicles with a DEF tank level readout. If you do use up all your DEF then the car will warn you, and refuse to start once it is switched off. This is a requirement of the Euro emissions standards, not that of the vehicle manufacturers. So if you’re out on the tracks and the DEF system becomes inoperable, or you lose your DEF fluid, you can keep driving but you can’t restart the engine once stopped. To get going again you’ll need some DEF, and you may need 3-4L, not a millilitre or two. Ford Everest warnings/information for SCR/AdBlue. Ford Everest warning light indication low DEF. If you are going on a big trip then it’s not a bad idea to top up the DEF before you leave even if you’ve had no low-level warning. Taking the Everest as an example, Ford reckon a range between of between 3,000 and 18,000km. The 18,000km estimate is for “steady highway driving”, and the 3,000km estimate is for “trailer towing / aggressive or city driving”, which would probably be true of sand driving such as the Simpson too. When you top up you’re not wasting any money as you’d use the DEF anyway, and it just saves the anxiety. You could take a small bottle of DEF with you, but if the tank is full your trip will be done and dusted well before the DEF is used up. So the only reason to take extra DEF would be if the DEF tank itself was damaged, which is possible but unlikely and fairly low down the list of potential problems. If the DEF tank leaks then at least in the Ford Everest there will be a warning. Ford told us that the Everest’s DEF tanks are “high-quality dual-walled polymer especially chosen for this use” and they had no issues with the tank during their testing. The Ford Everest runs on SCR and has raised awareness of the system in the 4X4 community. One problem for some people is that DEF may freeze below about -11 degrees Celsius. This is unlikely to be a problem in Australia, and if temperatures do drop that low then you’ll have other problems such as oils and diesel. You cannot add anything to DEF, so that means no antifreeze. Example of a 10L DEF bottle. What is AdBlue vs SCR vs BlueTec vs DEF? – AdBlue, SCR and BlueTec are the same thing, just different manufacturers and names. SCR is Selective Catalytic Reduction, the generic name for the system. The fluid used is DEF, or Diesel Exhaust Fluid. What standards should I look for? – all DEF should be compatible with ISO22241-1. The DIN70070 standard is the German version. AUS32 is not a standard, the ‘AUS’ refers to Aqueous Urea Solution, not Australia. What happens if my DEF runs out? – your car will keep running, but you won’t be able to restart it until the DEF is refilled. That is a requirement of the Euro 6 emissions system, not something vehicle manufacturers have made up themselves. Can I fool the SCR system? – no, it won’t work if it runs dry or you fill it with water, or anything else other than DEF. Where does DEF go? – in the DEF tank. It is not a fuel additive. Can I make my own DEF? – if you have to ask the answer is no. While the active ingredient of DEF is urea and you do make this yourself, urinating into your DEF tank is not recommended and the chances of the resulting warranty claim being approved are low. Is there a performance benefit to SCR? – no, it’s all about reducing emissions. However, you could argue that with SCR car engineers don’t have to do other performance-reducing things to the engine to meet emissions requirements. How big is the average DEF tank? – depends on the vehicle, but 4X4s are around 15-25L. What 4X4s/SUVs have SCR? – quite a few and more to follow. Examples are the Ford Everest, Jaguar F-PACE, ASV Ram 2500/3500. How often do I need to fill the DEF tank? – depends on the vehicle and size of the tank. Ford reckon between 12,000 and 16,000km for the Everest for ‘normal driving’, but 3,000 – 12,000km for “trailer towing / aggressive or city driving”. How much does DEF cost? – around $40 for 10L. That means, roughly, it costs around $0.005 per km, or $500 for 100,000km assuming 15,000km for 15L. It’s not a significant cost for a 4X4. Where can I buy DEF? – some servos, dealers of cars that run SCRs, aftermarket automotive outlets. How long does DEF last? – one or two years. There should be an expiry date. DEF should be stored in temperature controlled conditions as it is sensitive to its chemical balance. Jaguar F-PACE diesel and DEF fillers. The SCR technology is here to stay and required so that passenger diesel engines can pass Euro 5 emissions, and it’s also required for the light trucks to pass their Euro 6 standard. From the point of view of the environment it is a great idea, and that has to take priority over all else. However, it’s a bad idea for a touring offroader. What offroaders need, first and foremost, is a simple power system. SCR is a system that is not required for power production, yet can stop the car in its tracks, and it takes up valuable room. I’m sure we’d all rather carry another 18L of diesel or water than 18L of DEF. It is developments like these that are making petrol look more and more attractive. And, worst comes to worst, we’d like to be able to override the do-not-start system if there’s no DEF, just so we can drive out of trouble. But the governments of the world do not see things like that, correctly reasoning that if such exceptions were granted they would be abused. So we are where we are. However, do not write off vehicles just because they have SCRs, because if you do that then you very soon won’t have any new diesels to choose from. The SCR system is not particularly complex, and is well-proven in commercial machinery. We have yet to hear of anyone getting stranded due to SCR, although it is early days yet. If SCR bothers you too much then your only option is an older diesel or a newer petrol, because emissions targets are not going to get any less strict. Ford Everest 18L DEF tank, next to the spare wheel. Ford have produced a useful video showing the basics of SCR and how to fill up your Everest, and we pulled a couple of images from it for this article. UPDATE clarified -11 degrees not 11 above. This article can be found at Practical Motoring 4X4. AdBlue is extremely corrosive so what are the long term effects on the exhaust system & would this damage be covered by warranty ?. The club 4×4 article on AdBlue and SCR was very good but failed to mention the major benefit of SCR verses EGR and that is the massive reduction in heat rejection from an SCR system compared with an EGR system on a Diesel engine. Great article and definitely worth knowing about especially if you are looking at a new 4×4. My diesel Mazda CX7 runs AdBlue, its now going on 7 yrs and not had any issues – apart from the price Mazda wants to charge – only once have they filled the tank at over $100! compared to $22 for 10l from TruBlu Oil. My travelling mate has a ram 3500 towing a 36 ft 5th wheeler and he put in some DEF from a service station pump that was contaminated and it caused his vehicle to go into limp mode 40kmph was the max it would go he was lucky there was a mechanic nearby that had a can bus reader and was able to reset the alarm he also had to drain the DEF tank and refill with clean fluid. He lost 2 days travel due to this so he is not a fan of DEF. Very informative article on this adblue issue and the imminent death of the diesel motor which is extremely relevant in our case as I have been looking at a couple of new vehicles due to wear and tear on the front seats in the PAJ and our lower back issues. Now after reading this article I’m confused as to what to do. Am I to take a wait and see approach and see what comes of the Nissan/Mitsubishi merger or do I jump in now and go for an Amorok by VW which is to date the only vehicle I can find with fully adjustable driver and front passenger seats capable of towing 300kg on the ball. I’ll keep you posted on what my wife and I decide. Given that fuelling cars with LPG produces less pollutant than both petrol or diesel motors and that Australia is a major producer of gas, why has the debate ignored gas engine options for the future? Very good point indeed with the gas conversion . My Question is, how are the exhaust systems protected now, fitted now with all these extra devices. I Do not just drive on bitumen, with bull dust, soft sand and corrugated roads, to take a toll on the systems, and these are just over an hours drive from the city . This is the one world order. Do as I say. From the greens, who have no degrees. This adblue dose not add to the efficiency of the engine. It adds more weight to the vehicle. And more problems when the vehicle runs out of the adblue. A person came up with this material and paid politicians to get this made into law.